In any given market you need to know two things to make an intelligent buying decision; they are Quality and Price. Why are these important to consumers? They allow the consumer to pick the best product for the best price. Why is this important to the market? It creates competition, which improves quality and decreases price. It’s important to know the rules of the game when you start to play. An Unfair Advantage: Who makes the rules? Let’s discuss the quality of the prescription medication that you (or someone you know) is currently being prescribed. To understand the drugs quality, you must know these three things: Safety, Side Effects and Success. Now, think about what you know about these three quality items. If the answer is “not very much”, you are in the majority. The ability to compare, understand and make a decision about drugs in a therapeutic category is beyond most individual’s reach. Very few pharmaceutical companies publish their studies for people to find. Instead, consumers rely on marketing through advertisings, or opinions of friends and family when making these decisions. Additionally, popular name drugs without much benefit and with many risks and side effects unknown to most individuals are being over-prescribed by healthcare providers. Now, let’s move on to price. What is the actual price of any prescription drug? In order to figure this out you need to know the following factors. 1) Average wholesale price; 2) Discount given to the health plan by the pharmacy benefit manager (PBM); and 3) Rebates given to the pharmacy benefit managers by the pharmacy manufacture. Easy, right? Guess again? The pharmacy benefit managers (PBMs) do not disclose drug-by-drug rebate information. Instead, rebates are given back to the plans in lump sum payments without supporting details. Here in lies the problem, doctors, let alone their patients don’t know the true price of medications, leaving them unable to select lower cost, equally effective alternatives. Plans are not positioned to determine if PBM’s are favoring higher cost drugs. And, there isn’t any market competition to force better quality and lower costs. Consumers ignore drug prices and use high cost drugs without knowing their success rates, safety or side effects related to the use of the drug. They are virtually unable to research if the drug they are currently being prescribed is actually “the best and safest” alternative. Manufactures give doctors “free samples” of high-cost drugs to distribute to patients, thereby promoting the use of and causing inappropriate prescriptions of high cost drugs. Manufactures market “high-cost” drugs direct to the consumer, spending billions of dollars each year in commercial advertising. This promotes patients to request the latest “miracle” from their provider without knowing the quality of the product. Prescription benefit managers (PBMs), “the middle-man”, also have a significant impact on drug costs. PBM’s and manufactures make “secret deals” on higher cost drugs. Rebates are given back to the plan, but “secret monies” are retained by the PBM’s. PBM’s also negotiate inflation protection rebates, the more the price of the drug increases the more money the PBM retains. 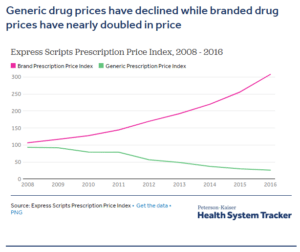 Prescription prices continue to soar. Consumers continue to lose ground. Consumers need to know where to look for information on medications just as they would look for information to buy a new car. Establishment of an easy to understand drug comparison tool that consumers can utilize to determine which drugs in the same therapeutic category will best treat their health problems would be a good start. Consumers need to have a complete understanding of the risks and side effects associated with taking the drug. They need to be able to find this information easily and not rely on biased providers and PBMs for information. Manufactures and PBM’s must disseminate information about the safety, side effects and success of the drug, including clinical trials results that show percent of improvement and side effects that could result in other health problems. Employers need to discuss these issues with consultants and carriers. Additionally, providing quality and cost information on drugs through newsletters, articles and at open enrollment will empower employees to make better decisions in managing their own health care. However, for many employers, especially smaller employers, navigating through the pharmaceutical playing field can be daunting. Negotiating with PBMs can be challenging. But there is strength in numbers. Working with local coalitions and major corporations, small employers can leverage themselves for the next inning. The Florida Bankers Health Consortium (FBHC) is one way for Florida Banks to leverage themselves in the Prescription Drug Game. The FBHC works with the most knowledgeable consultants and coalitions to do the work that it takes to ensure that the employers’ and employees’ best interests are being served. With healthcare education, well-being initiatives and strong negotiation, the FBHC is a formidable ally. Garnering the strength of over 60 Florida community banks and 6000 enrolled lives the FBHC stands with organizations like the Florida Healthcare Coalition and major US corporations to fight for employers and their employees to ensure quality, safe and successful prescription drug care. SelectSource came about from the foundation of the FBHC established in 1962 as the Florida Bankers Insurance Trust (FBIT), our organization began as a not-for-profit serving the Florida Bankers Association (FBA). Today through SelectSource a wide range of businesses benefit from Human Capital Management Services including employee benefit administration, payroll and HR. You can rest assured that our team is fully committed to delivering the highest quality service to our clients (employers and employees), brokers, agents, and partners. We value and provide integrity, honesty, transparency, excellence, and mutual respect— because you and your employees, deserve nothing less.